Just saw this thread - gorgeous helmet, bro. 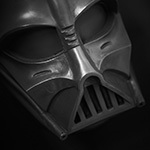 Also quite a nice camera you got there if I may say so And I agree: There are definitively way to few high res shots of vader helmet or parts here on the den. It's brought up in the past, and I agree, the dome probably should come down a smidge. What's the best way to lower the dome? My first thought was wrapping the mounts in blue painters tape (inside and out), then using a file to file away a little a time until it sits at the height where I want it.